Have we underestimated Dinesh Karthik? There’s reason to believe so! Cricket likes flair players. They amplify the sport. They make it truly worth your while. But can one classify Dinesh Karthik in the list of players with flair?is a flair player? Probably at first look, a fairly uncomplicated bloke who is habitually stuck with the task of clearing the boundaries coming down the order doesn’t seem like one. On March 18, 2018, what Dinesh Karthik did by taking his side over the ropes in the very final over was nothing short of extraordinary. This match-winning knock has earned him a permanent space in cricket’s glory books. It furthered the Karthik-ness of his career; it saved him from plummeting further in what has until now been a rather low-key existence in the star-studded side. Yet, at the same time, it posited a case for having this limited overs specialist around even in cricket’s most unpredictable template. You couldn’t believe the scenes. You didn’t see it coming. And probably, neither did Karthik. 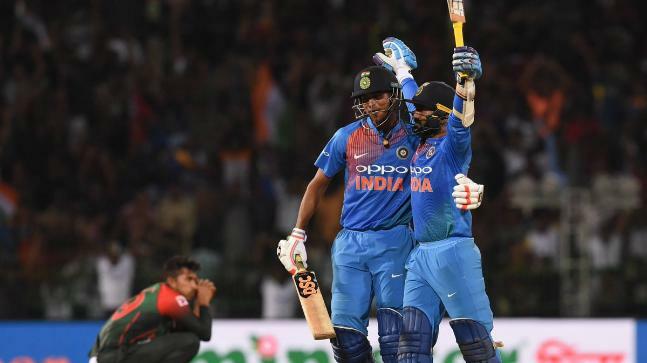 But in hitting the final ball six- an effort that is being equated fashionably to Miandad’s heroics- Dinesh Karthik cemented a place for himself in copious history books. Perhaps his final ball thriller- replete with a pop music buzz and fashioned by keeping his wits about himself- has earned him the rare distinction of striking the most famous knock by an Indian lower order bat in innings that didn’t cross a fifty or hundred. It wasn’t a long heave over mid-wicket, nor was it a daredevil blow down the deep square leg region either. It was a flat hit; an imperious six pounded from the frontal face of the bat toward the cover region. It ensured Dinesh Karthik’s longevity, and at the same time rescued him from oblivion. It, in some ways, brought back memories of his fiery unbeaten 64 against New Zealand, an important knock at Number 4 that guided India to an impressive, series-levelling victory against the Kiwis. To others, it might have revived memories of that unsung 79 he had struck when Tendulkar’s gladiatorial double-ton against South Africa cast a shadow on his scintillating effort. But the truth is, in each of the three-match winning innings- Karthik answered the call of selectors by maintaining a very brisk scoring rate. Interestingly, despite being at the helm of fashioning some important run-chases, Karthik hasn’t always been made to bat at the top in his routine cricketing journey. Two of his three match-winning scores in ODIs have seen him appear at number 3 and 4 respectively. Possible revival of Karthik’s career? What other hints are the selectors waiting for? What appears to us fans at the back of a failure or two in an ODI is Karthik’s ability to resemble a lame liability. But what it doesn’t appear to fans and critics alike is just how little has Dinesh Karthik been made to play in limited overs cricket. In case you are scratching your scalp for proof, here’s some telling statistic. Despite debuting back in 2004- about 14 cricketing summers ago- Karthik hasn’t yet played 80 ODIs? Which team does that to a specialist wicketkeeping batsman? Even a West Indies is giving chance to Shai Hope. Forget the natural talent. But already in close to two years, Hope’s played ODI number 30. He has a world ahead of him at 24. But at 33, Karthik’s reached his peak, or very nearly the peak. Karthik also happens to be a batsman who cherishes his bat doing the talking for him. He likes sending the ball over the boundary and his shots, particularly square of the wicket are a treat to watch. Although a calm player and a mature head, he would like to work on certain minutiae of his game. Particularly the ability to safeguard his wicket that often comes under danger in his want to accumulate runs quickly. But that said, being elected the captain of Kolkata Knight Riders, heading into the forthcoming IPL might offer a litmus test to Karthik’s leadership abilities. But ever a fighter, one can expect Karthik to stand head and shoulders over the onerous challenge.